This is something we will discuss tonight at our meeting at Tinton Falls Borough Hall, starting at 730 p.m., but we wanted to share this in advance. 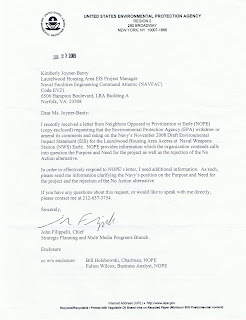 Fulton Wilcox, NOPE's business case analyst, a few weeks ago drafted a letter to the EPA's Region 2 director, encouraging the agency to withdraw or amend its comments on the Navy's supposed need to go thru with civilian housing at NWS Earle, and much to our satisfaction it appears the EPA is taking this suggestion very seriously (EPA response letter attached). NOPE argues that the Navy's "Laurelwood EIS" proves misleading on the "No Action Alternative," which was erroneously written off by investigators as part of the process of determining whether the Navy should pick one of four unimpeded civilian access routes thru the Earle base to the Laurelwood homes, or option five - the No Action Alternative - which basically means the base would run as is and the Navy would not go through with the outlease of the 52-year housing contract with Laurelwood Inc. (i.e. void or buy out the contract). NOPE has long argued that the No Action (or "No Build") alternative is by far the most logical, particularly in terms of the environment, since no road construction and no civilian tenants means no detrimental impact on the environment. The option to build a road and house civilian tenants on the base from 2010-2040 has wide-reaching impacts, not only on the core "environment," but also on Earle's mission capabilities and on the surrounding communities. We will keep you posted on further correspondence with the EPA.